Yesterday, my wife and a friend of ours headed into New York to visit the Chinese consulate. If you have not experienced the efficiency, warmth, and clarity of dealing with the Chinese bureaucracy then you are the richer for it. However, shocking to us, the consulate seems to have reformed itself a bit. Rather than the 8 or more hours it can take simply to get to the window (and then be rejected for a visa) we were in and out (and approved) in about an hour. This good turn left us with a whole day in New York! So we decided to head off to the Metropolitan Museum. I was particularly excited about the Byzantium and Islam exhibit, the Chinese printing exhibit, and my favorite, the Arms and Armor exhibit. Also not to be missed is the relatively new Greek and Roman antiquities wing. Each comparison to the museum is, as you may have noticed, to demonstrate the stagnant nature of the museum in contrast to the speaker’s own vibrant, effervescent vision of the Church. I actually find myself wishing that the Church was more like a good museum. Museums are places that generate excitement in us but may, on occasion, also inspire dread. They can bring us into contact with some of the most important elements of our history and identity even as they sometimes present those vital pieces, moments, or times as if they were forgettable or lost in the rush of time. The trick in the museum is to present an object so that it communicates with us – so that it is not simply an object of studied and indifferent origin but is in conversation with us. This conversation forms us. It creates in us an understanding that this piece before us is part of us. Our conversation and engagement with it continues to craft some part of us. Great museums do something great churches can do – they tell us who we are. Moreover, with training and study, they can form us for the future. To the untrained eye there is something that immediately attracts even while always revealing some new complexities and patterns that reward careful study and meditation. Yet we too are afflicted with the question of value. Why do we matter? Who will notice if we are not around? I would contend that we matter because we answer the deepest need of human existence. However in a culture that is beset with consumptive utility, the ability to consume and be consumed, as its driving force, churches and museums alike will be called to answer for themselves and for their usefulness. Yet we answer those questions that we are trained to forget even exist. The question “Who are we?” is up for grabs in a culture that sells identity. A culture with no sense of who it is is malleable, formless, and ultimately forgettable for it will have left nothing that can be seen, known, or is even, in the truest sense, present. Such a culture will be at the whims of those forces which always step into the void. Whether shameless corporate manipulation or political peddling some other narrative will drive the creation of identity to the point at which any sense of truth, beauty, or dignity is simply manufactured in the most profitable or politically expedient way. Museums and the Church offer a counter-cultural understanding of the world. They invite us into a scope of history and meaning in which the full flourishing of humanity is pursued. They are an encounter with those things which are most essential to remember and most easy to forget. Their “usefulness” only extends so far as their understanding of their central story and mission. Not every museum offers this. Neither does every church. The Church has, in many ways, a similar charge as a museum. We communicate identity, curate elements of tradition, lead people through a journey, connect people across cultures and time, offer an entry way for the novice, connect themes and ideas across fields, and offer historical examples for the future. Beyond this, as the Church, we also offer a life-altering encounter with a living God whose power is always at work in the world. Our role is descriptive as we share the story of the arc of salvation. It is also didactic as we offer the lessons of thousands of years of tradition and theological insight. It is also prescriptive as we offer an understanding of the Christian’s life and role in the world. It is also experiential as the Christian is drawn into the life of God by the working of the Sacraments and in the holiness of relationship. Why does faith matter? Who is Jesus today and who has he been? How does the faith of centuries shape our faith today? Is there a God? How do we understand the afterlife? When a visitor walks into our churches they need to hear people dwelling with these very questions and finding, in the shape and life of the Church, a life-giving encounter with the Holy. Even as they answer individual questions about particular objects of interest, museums also portray the sweep of history. They give you a sense that the particular dwells within the context of the whole. Docents carefully answer every question and guide people to a deeper understanding of the transitions between space, place, and time. Great museums and Churches are grounded in both the depth of history and tradition as well as the very real needs of the communities around them. Great museums become voices and actors in their communities because they know how to engage the world around them as they tell a living story. the American Visionary Art Museum, has a mission simply to “expand the deﬁnition of a worthwhile life” by presenting and encouraging creativity in untraditional venues. The Denver Museum of Contemporary Art describes itself as an activator, content provider, and immediate research vehicle of culture in the making—a museum without a front door—a place for public engagement. A judge with the Hague was interviewed about overseeing the trials for those that had committed atrocities in Sarajevo. He was asked how he kept his sanity and his faith in the face of such a relentless press of the worst of human barbarism related day after day. He said that he would frequently visit a nearby museum to look at the Vermeer paintings and be reminded of the stirring beauty that humanity was capable of. Churches, at their best, offer this chance. We offer the chance for those beset by the cares, occupations, and struggles of this sometimes wearying life to find a place of rest, refreshment, and new meaning. They can be reminded of the beauty of God and the promise offered to each of us. Each person that enters the space has something to offer to the whole understanding of the life of the Church. As in a museum, the curated meaning is not the only one. There are a host of challenging and enlivening insights that will come from those new to the exhibit. We also have to be ready as the Church not simply to expect visitors but to give them space to shape life and meaning along with us. So we are tasked with bringing forward and nurturing the tradition even as we are ever open to new interpretation and ideas some of which will stand the test of time and some of which will fade away. Great museums allow for this sort of interchange. 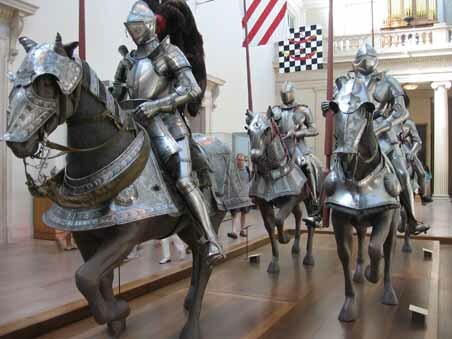 The fascinating thing about the arms and armor exhibit at the Metropolitan, for example, is its sense of movement. You feel in the midst of this history swirling about you and can imagine that hooves are pounding and pennants fluttering. You see in the exhibit a progression of history as well and understand the link between one piece and the next. You see the influences that one era has on another until you are, even without realizing it, seeing patterns that resound in our own time. Yet, this does not happen on its own. There are not speakers playing whinnying horse noises or actors in olde English garb railing at the peasantry to stay out of the road. We bring something to the experience too that is vital. Welcome to the Matilda Joslyn Gage Center where Matilda Joslyn Gage lived with her husband Henry and their four children and carried out her work for social justice from 1854-1898. Rules of the house: 1) Check your dogma at the door; 2) Think for yourself; Please dialogue with us about the challenging ideas you will ﬁnd within these walls and together let us envision the world we want to create. Please feel free to take photographs, pick up books, play with the toys, sit on the furniture, and most of all write on the walls! Oh that the Church could be more like a museum. Like many others I have warned before about the dangers of letting the Church become like a museum. Perhaps it’s an attitude of mine that I should reconsider. Wonderful reflection. Thank you. The Metropolitan has come a long way since the many school tours that brought nothing alive for me. I can tell I need to go back. Learning how to bring spaces and ideas alive is definitely something we can learn from in history and in church.